When young musicians begin to collaborate, they tap into new and unexpected insights about themselves. For example, they might discover that Bob Ross is their spirit animal. That's one of the many things that the members of Happy Little Trees, have unearthed as a result of collective music-making. 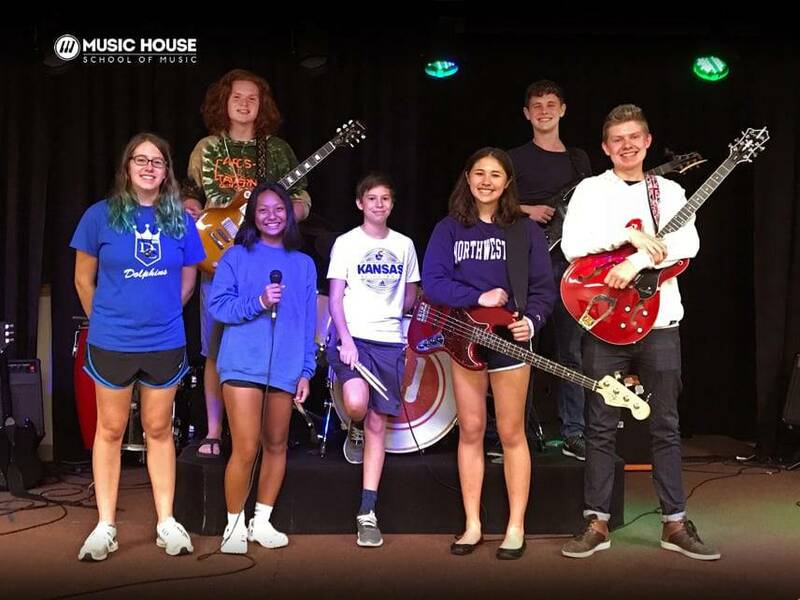 In the midst of their preparation for the upcoming Fall Music Fest these young musicians took a moment to talk about who they are and what they've learned as band workshop members here at Music House. How did your band come up with that name — Happy Little Trees? Tell the story. Nathan Perdieu: That's easy. Bob Ross is our spirit animal... of course. What is something you've learned from another musician in your band? Sidney Gana: I've learned that I could have better rhythm, which is an important lesson. If you could magically convince one famous musician, living or dead, to join your band, who would it be? George Beatty: Jimi Hendrix or Slash. Sam Shoemaker: Jimi Hendrix or Lane Staley. Why is it so important for a musician to perform and collaborate with other musicians (as opposed to always just practicing alone)? Sam Shoemaker: Because you learn more and make friends. Emerson MacKenzie: You learn to cooperate with other people. Sidney Gana: That's right. If you don't cooperate, you'll just come off as unfriendly and antisocial. Nobody wants that in a band! What do you guys do that's special—that sets you apart from all the other Music House bands? Emerson MacKenzie: We socialize outside of band, which helps us gel more musically. Also, we don't play very edgy/hard music. Madeline Willson: We help each other with our math homework. Describe the most excellent, memorable moment you've ever had with your band. Madeline Willson: Every time we all play without messing anything up. Emerson Gana: Putting facepaint on before the last battle of the bands is a good memory. Garrett Brax: When Maddie brought us ice cream! Imagine one of your friends takes private lessons somewhere (not at Music House). They tell you that they love music and wish they were as good as you, but they're getting bored with lessons and might quit. What advice would you give them? George Beatty: Join a band!!!! Play with other people that are better than you to improve! Madeline Willson: Community is a good thing. It forces you to learn the hard stuff, like music theory. Emerson MacKenzie: Join a band! Meet other people. Be sure to join us at this year's Music House Fall Music Fest to hear this band and seven others serve up their best. It's going to be a big party featuring lots of amazing people! Want to learn more about Music House lessons, classes, and bands? Just click the button below.